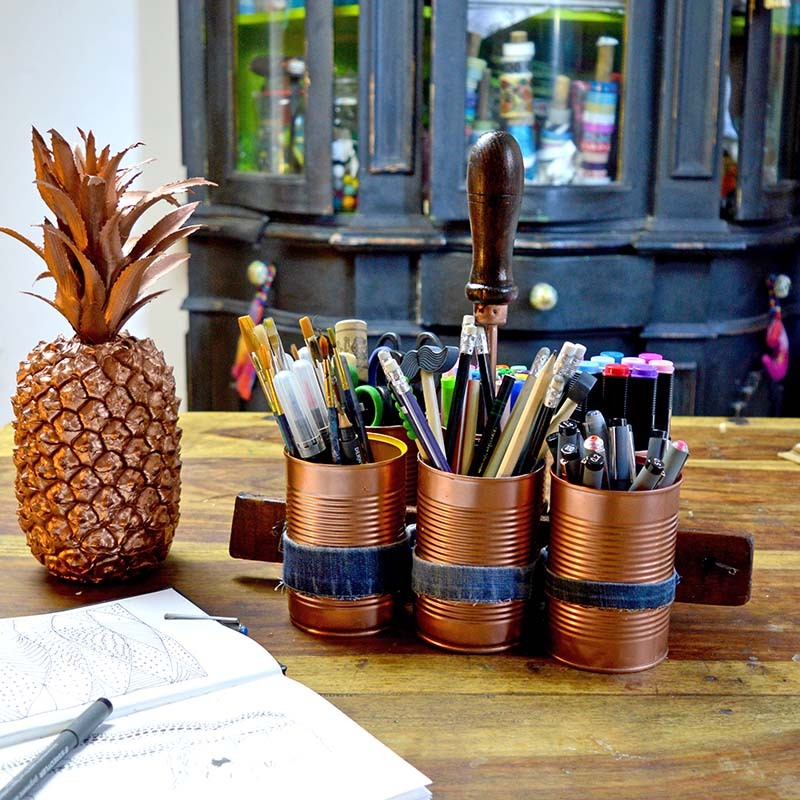 A few eagle eyed readers, have spotted my craft cupboard lurking in the background of a few blog posts, such as my Copper Tin Can Caddy. This classy craft cupboard transformation was completed a few years ago, and as requested here’s how I did it. I don’t have the luxury of a dedicated craft room. Most of my crafting is done in the dining room, or in the garden when the weathers good. Therefore I wanted a craft cupboard that wouldn’t look out of place in a dining room. It also doubles up as a cocktail cabinet. Personally, I think cocktails and crafts are a great combination, some of my best craftings is done after a couple of cocktails! Or perhaps they just look better after a couple of cocktails! 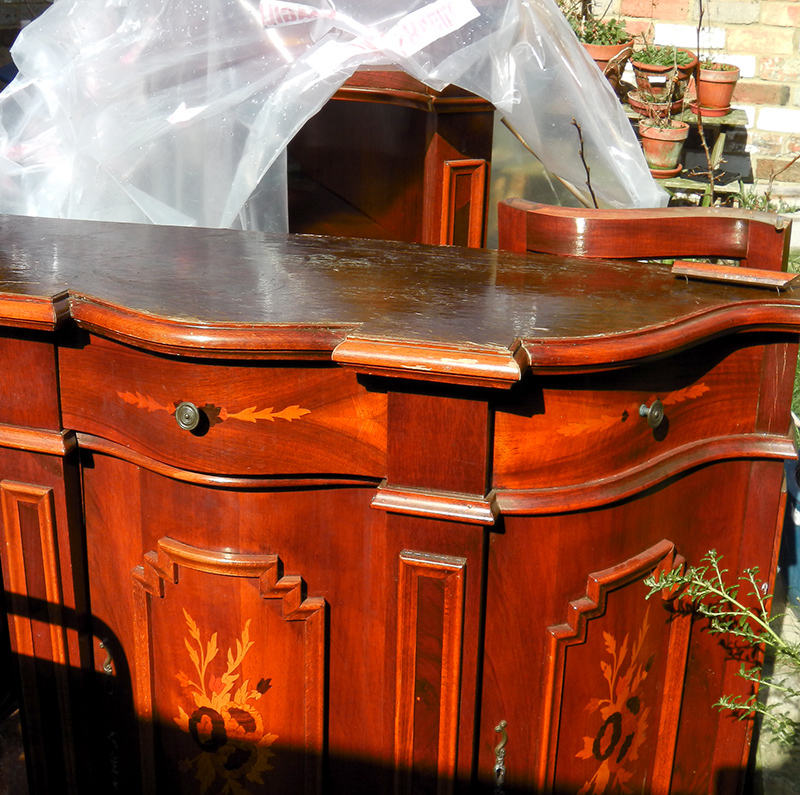 I picked up the glass cupboard really cheaply from my local auction house. Well, actually my husband and son picked it up for me as I was in London that day. I remember their texts that day, they were not impressed and were cursing me for buying such a big ugly piece of furniture. They didn’t have my vision, and I must admit the glass cupboard was pretty ugly. Now after my cupboard transformation, everyone loves it. I must admit it is probably my favourite piece of furniture in the house. It’s all about the colour and the curves. This was a large cupboard, luckily it split into two easily, which made the cupboard transformation a lot easier. I’m a bit lazy and hate sanding and priming wood for painting, it’s so tedious. Therefore, I was over the moon when I discovered Chalk Paint. I couldn’t believe it no prep needed! 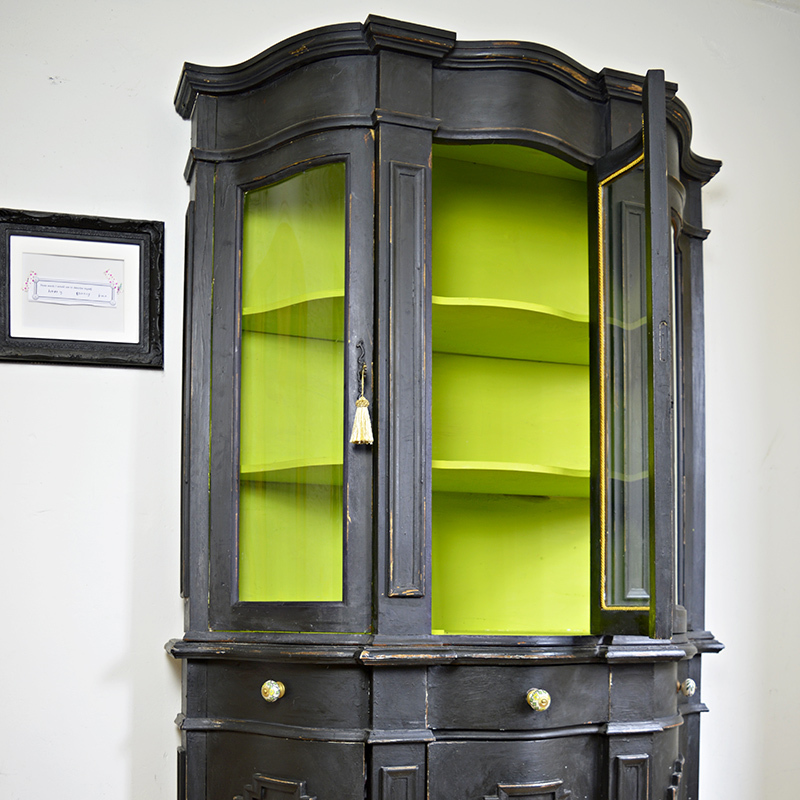 I used Annie Sloan Graphite paint for the outside of the cupboard. I wanted something brighter and more dramatic for the inside of the cupboard. 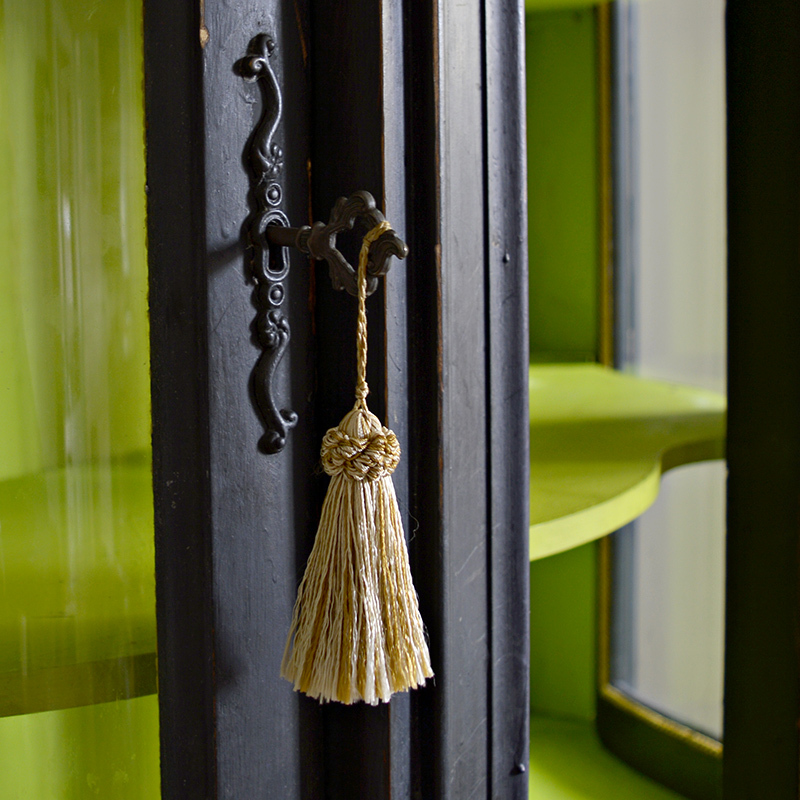 At that time I couldn’t find a chalk paint in the lime green colour I wanted for the inside. I did, however, find several recipes on Pinterest for making your own chalk paint. Making chalk paint is so easy, you basically mix one cup of fine tile grout powder to two cups of paint. As I only need a small amount of lime green paint, I got a small pot of emulsion made up in the exact lime green shade I wanted at the DIY store. I then carefully added the correct amount of tile grout to it, and mixed thoroughly. 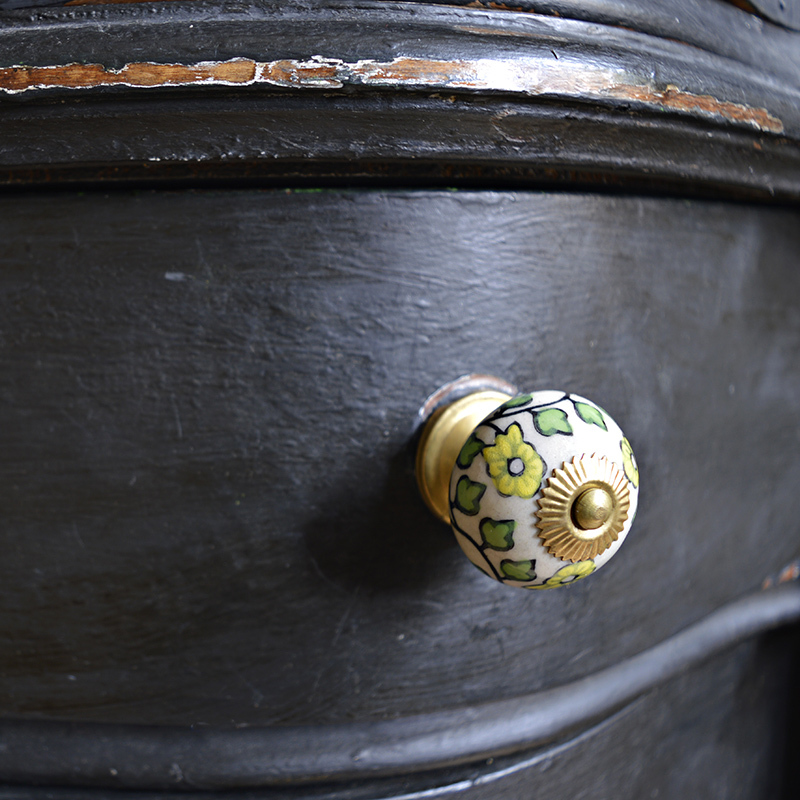 New knobs for the drawers that added colour to the cupboard transformation and matched the inside. 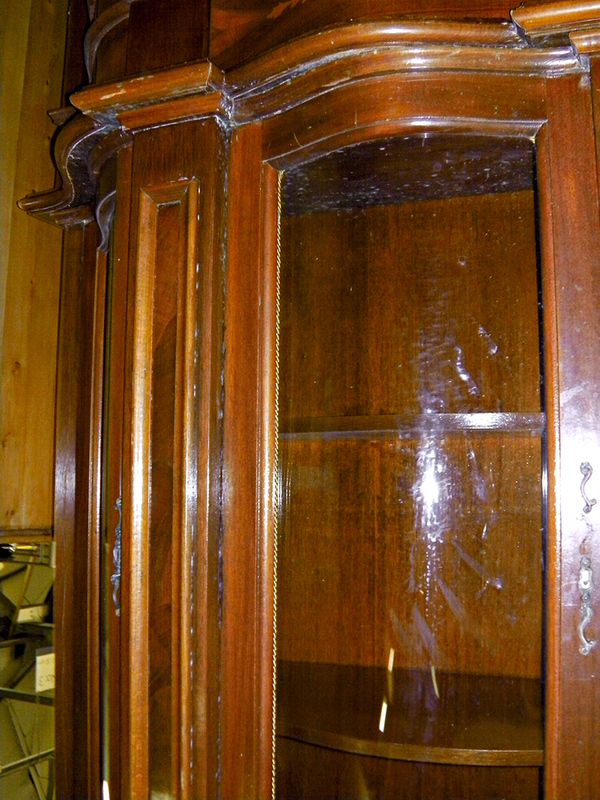 First I gave the cupboard a good wash down I think it had been sitting in a garage for a few years so was a bit dusty. I then taped newspaper to the glass doors to protect them. 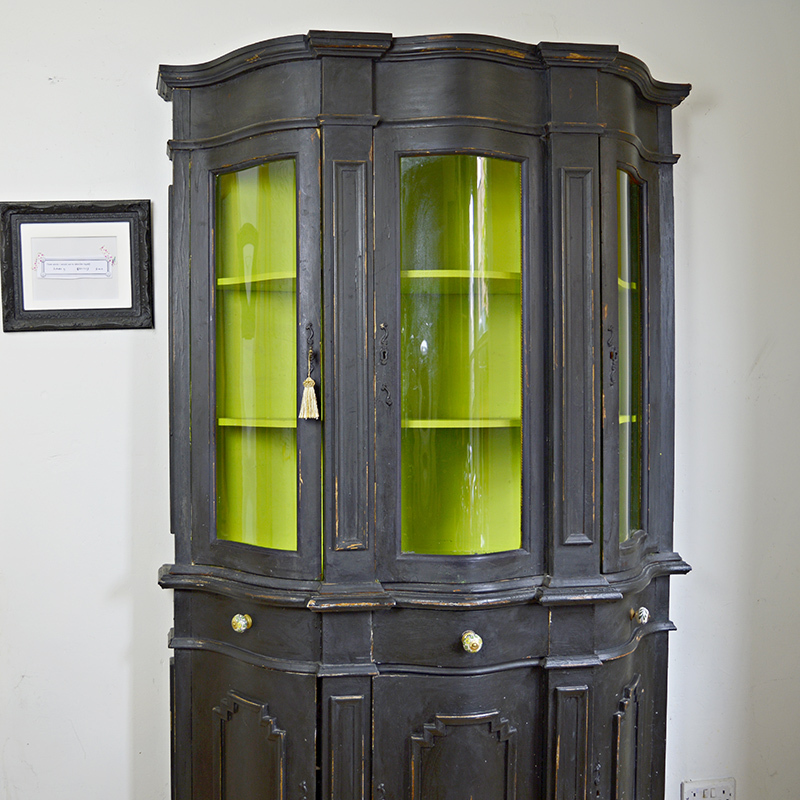 The outside of the cupboard was painted in the Annie Sloan Graphite and the inside in my homemade lime chalk paint. 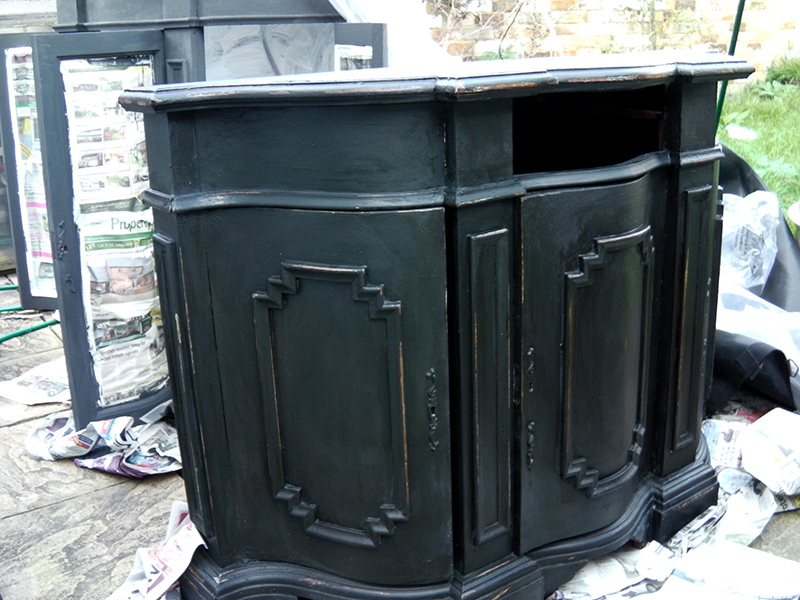 To give the cupboard a more aged and slight distressed look. I waxed the outside of the cupboard with the clear wax. I then sanded off the paint in the corners and edges to reveal some of the wood underneath. To add finishing touches, I changed the handles to some more colourful porcelain ones I found. 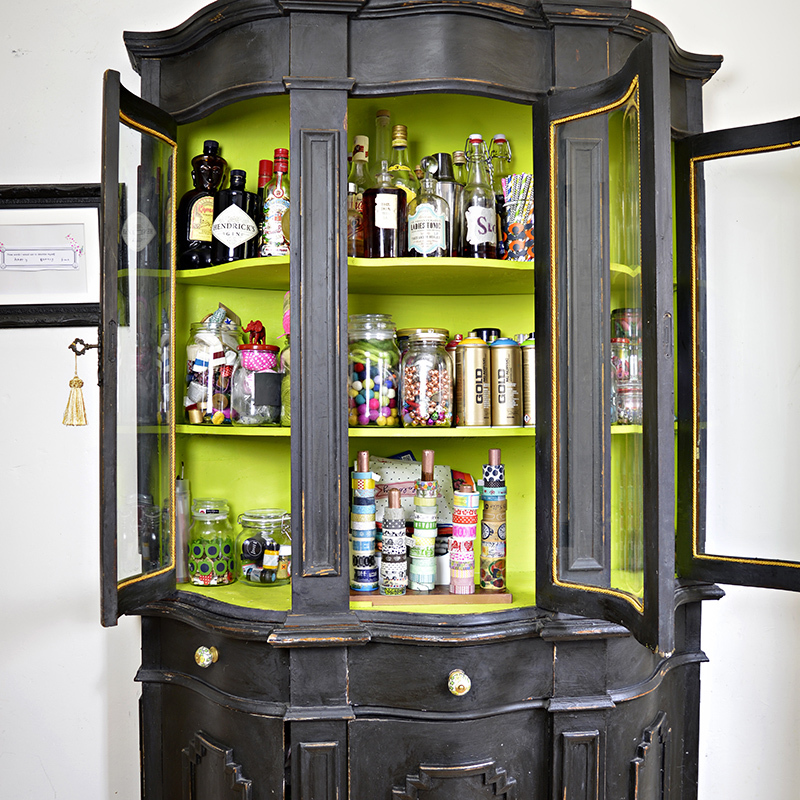 The thing I love about this craft/cocktail cupboard is the curved glass doors, which show off the bright colour inside. I love the fact that my colourful craft supplies are visible through the glass. I can show off my washi tapes on their holder along with my sloe gin collection. My craft supplies now have pride of place in such a classy looking cabinet rather than confined to some more practical but ugly craft storage cupboard. 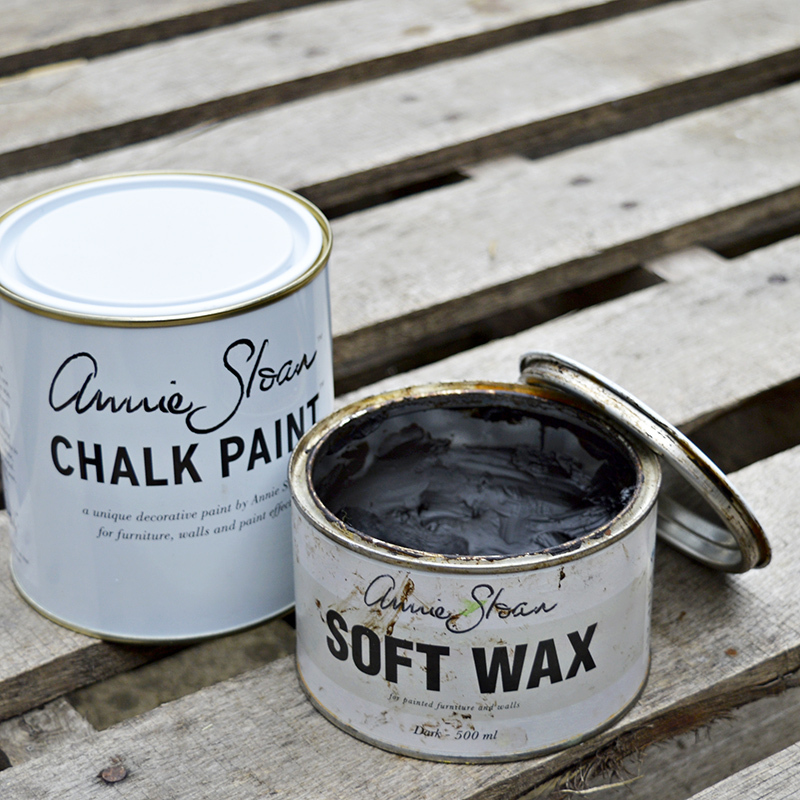 I had some of the Annie Sloan graphite paint left. Instead of lime green this time I combined it with gold for a fun Pineapple stenciled table upcycle. 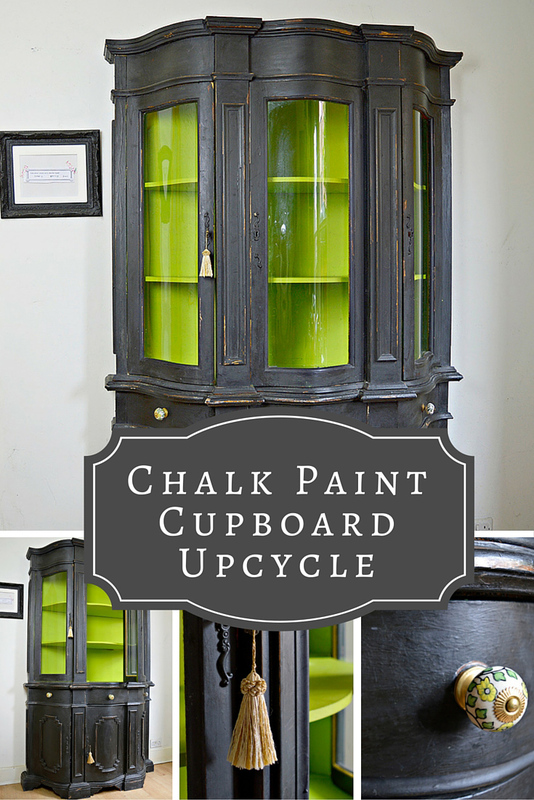 Also, you might want to checkout my other best chalk paint cupboard upcycle. Gorgeous! 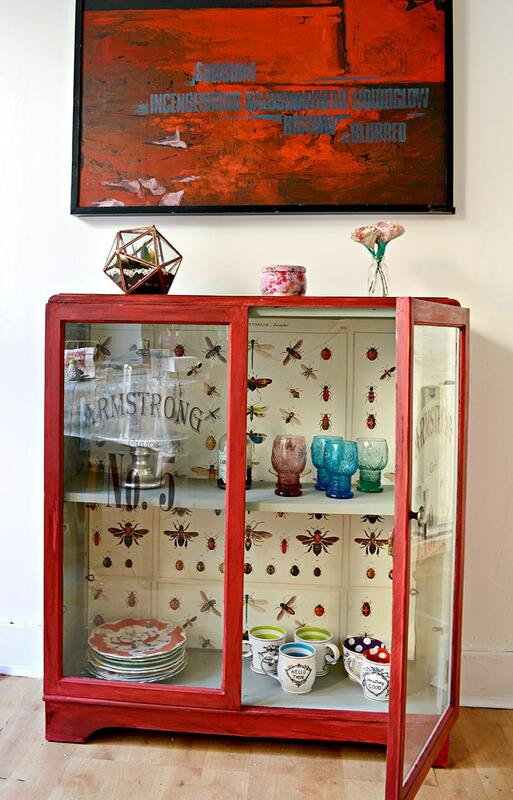 Adore Annie Sloane paint and this combo of colours is amazing. Thank you and yes I think Annie Sloane is the best chalk paint. FYI: You could have mixed up ASCP to get the Lime green as well! It’s lovely! One of my favorite colour combinations! Kudos!! Thank you. I’m not very good a mixing paint but perhaps I’ll give it ago next time. You really did a great job, also being courageous with the bright inside! Did you also wax the inside? I also have a similar project and am uncertain, if I should wax the inside (could be a bit sticky). Thank you ! I did use wax on the inside if you buff it it shouldn’t be sticky at all and it protects the paint. Claire this is so impressive. The words Grandly impressive come to mind. And that lime gives it a bit of whimsey! The perfect antidote to the stark grey. And it compliments the crafts inside perfectly. Thank you for joining us at Sweet Inspiration. Thank you Mary, I do love a pop of colour. Claire, love what you did with the cupboard!! You are courageous and that green inside makes it look awesome! I also invade the dining room, the kitchen and my kids’ room when craftying/DIYing, I keep telling them I can’t help it, I am expansive!! Thank you so much for sharing at Sweet Inspiration, I hope you have a wonderful week! Thank you ! I recently migrated into my sons room but now he’s back from University for the summer I’m going to be crafting more outside. Looks so great! Thanks for sharing at Merry Monday! Cocktails and Crafts are a perfect combo. I love the transformation and the pop of green is gorgeous! Thank you for sharing your links with us this week at Celebrate Your Story. Yes, I love a cocktail when I craft. Thank you ! Thank you ! I think the colour makes it. What a wonderful transformation! It looks great in your dining room. Thank you ! Yes it adds a bit of class to it. I love the pop of color you painted the inside of the cupboard. It looks fabulous. 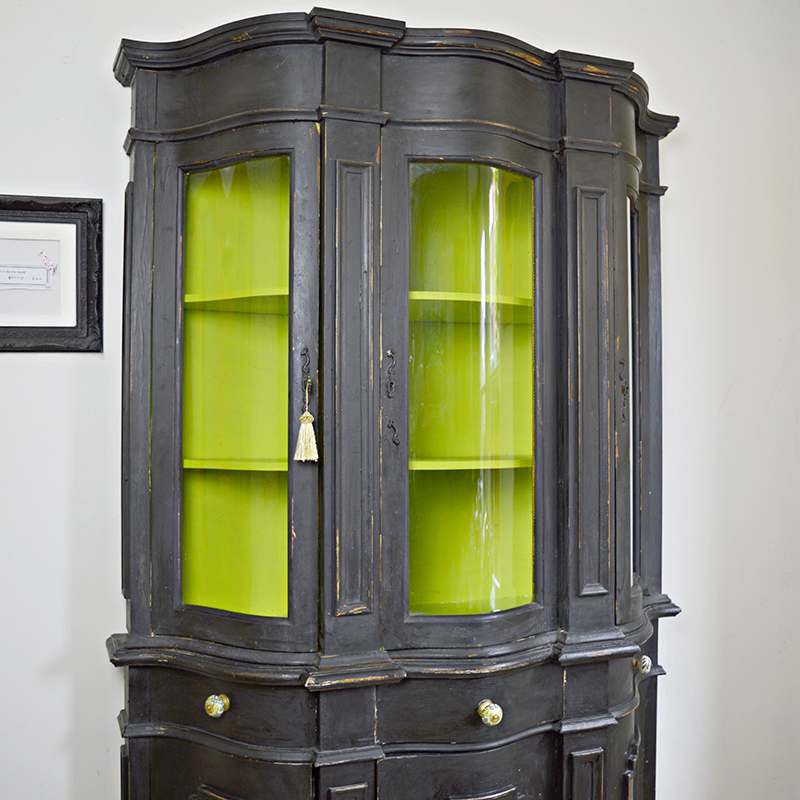 Your cabinet came out beautifully…♥♥♥ the lime interior! Visiting from Dishing It/Digging It. Crafts and cocktails, how fun! thanks so much for sharing on craft schooling Sunday! This cupboard is gorgeous! I love the green on the inside! Thank you for your kind words and thank you for the invite. 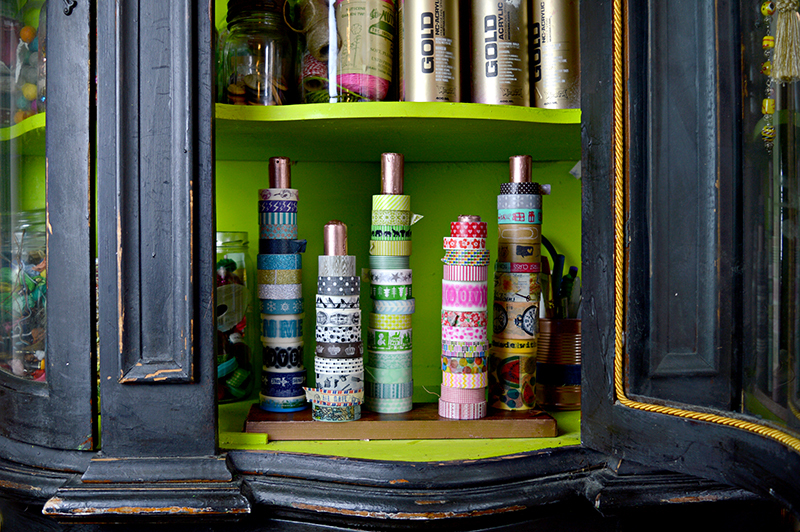 How fun to corral your craft supplies in such a decorative way and in a cabinet your refurbished yourself! I love the idea of using less space efficiently. Thanks for linking up with Funtastic Friday! Thank you ! I could do with a couple more cupboards my craft supplies just seem to grow. I love everything you did here. Thank you for sharing. 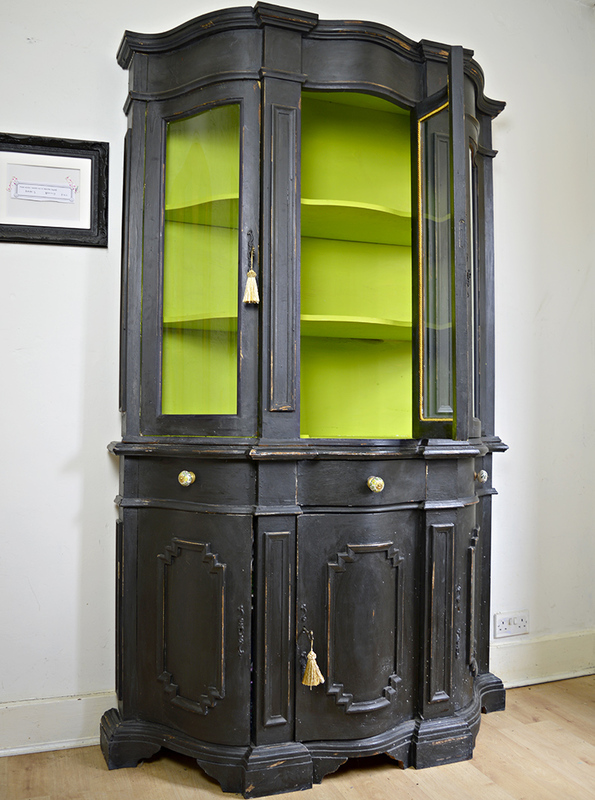 I ABSOLUTELY love the green that you painted on the inside of the cupboard, gives it some funk, but still looks traditional. What a fantastic choice! I absolutely admire your color courage! This turned out gorgeous! What a beautiful piece now! Well done! If you would like to share this or any other makeover at one more party, Making Broken Beautiful (runs every Thursday thru Sunday) is happening over at The Curator’s Collection right now and I’d be honored to host your talents! I hope you have an amazing day! Thank you ! And thanks for the invite. I love the green interior. And the knobs are perfect! Thank you ! Yes the knobs were a lucky find. Claire, you had vision and it worked! I laughed when you said your family just didn’t get it. That happens here and I have to tell them to just trust me. Your craft cabinet is perfect. I love the colors you chose and the shape of the piece of furniture. Thank you ! I do get a lot of eye rolling from my husband and boys they don’t get it half the time. Gorgeous! I love the green inside and the knobs! Thank you for linking up with us this week at The DIY Collective Link Party! Please come back and party with us again next Thursday! I just stopped by from Talk of the Town to comment on your beautiful cupboard. You did a great job and I love the pop of lime green! I’m in the process of painting a couple of chest of drawers for our bedroom and I’m using all Anne Sloan’s chalk paint and loving it. Thank you ! The best bit about the Annie Sloan paint is no priming.